Shopping for Game of Thrones Prop Replicas? Based on George R.R. 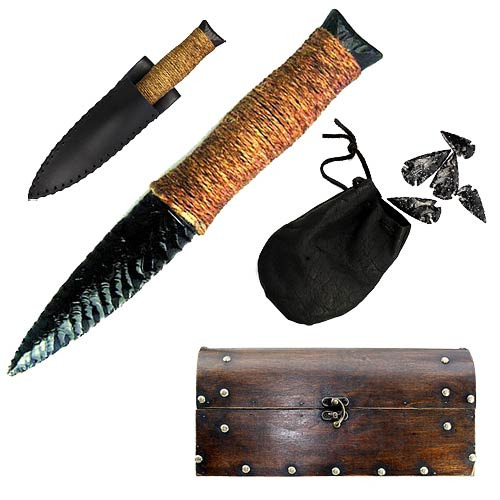 Martin's book series, A Song of Ice and Fire, the Beyond the Wall Survival Kit includes a genuine handcrafted 9-inch obsidian dagger, black deerskin leather belt pouch, 5 obsidian arrowheads, black leather sheath, collectible wooden storage box, fabric map of wildling territory for taking on your next ranging, and a letter from Jon Snow (written by GRRM) issuing your orders. In making this kit we aimed for an immersive authentic experience. The kit is designed and built as if it were something issued to a ranger of the Night's Watch as part of a mission. Everything has been handmade with natural materials where possible and distressed to reflect what materials the Watch might have available to them at Castle Black. All swords come with a certificate of authenticity personally autographed by George R.R. Martin. This is a limited edition of 2,500 pieces, each dagger diamond etched with an edition number. Ages 18 and up.